Microsoft Access is relational database software that allows small teams and individuals to easily organize and report on business data. Microsoft Access is a file-based desktop application that enables organizations to manage and leverage data. The relational database also includes tools that allow you to quickly build database-bound forms and reports. Whether you’re new to Access or an advanced user, Microsoft Access training from iCollege can accelerate your database management skills. Learn the basics, such as how to create a database, navigate the Access application environment or organize data stored within Access tables. Or, graduate to more advanced skills like form customization, querying and sharing data across applications. Access 2016 has all the functionality and features you're used to with some added enhancements and the best new features from Office 2016. This course is for anyone who wants to develop or improve their skills in MS Access. This course is for anyone who want to become proficient in MS Access. This Microsoft Excel 2016 training course with will teach you fundamental and advanced spreadsheet skills. With real-world examples taken from a business environment, you'll learn about number formats, data visualization, PivotTables, What-If Analysis, Forecasting, 3D maps, and more. Excel can be challenging to learn. The hardest part is knowing what to learn. This course is designed to teach you the most popular functions and features of Excel that most people wish they knew how to do. This includes the 7 most popular functions. Tons of tips and tricks to make using Excel 2016 easier every day. Microsoft Outlook helps users and businesses manage and prioritize communications, organize workloads and coordinate schedules. Outlook also integrates well with many popular business environments, devices and applications including Active Directory, SharePoint, Exchange, LinkedIn and Salesforce. You will be able to manage your emails, calendar events, contacts and tasks. Any person is capable of taking this course as the course begins right from the scratch. 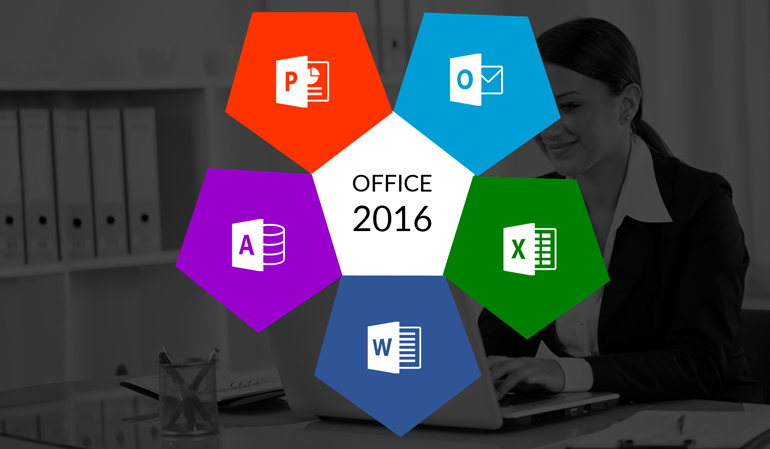 This course is for anyone who want to become proficient in MS Outlook. Microsoft Word 2016 is a very popular word processing program that can be used for both personal and business purposes. While already feature rich and critical for productivity, Microsoft continues to improve and enhance their software with each new release like the latest Microsoft Word 2016. In this course, you will develop and improve your Microsoft Word skills, so that you are able to maximize this industry standard word processing system. This online training course will cover Basic Word 2016, Intermediate Word 2016 and Advanced Word 2016. Produce, edit and format professional documents. Create tables, charts and graphics to organize content and assess data. Design templates to automate document formatting and creation to improve efficiency. This course is for anyone who want to become proficient in these areas.